The field identification of the Downy Woodpecker vs. the Hairy Woodpecker can be tricky at best. I wonder how many times in the past I have actually seen a Hairy Woodpecker, thinking it was a Downy! 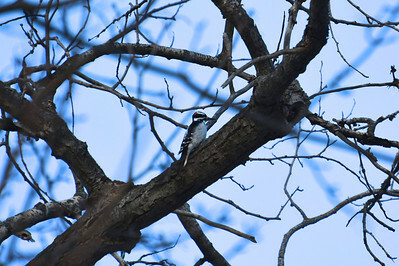 For the past month, I have been studying the small distinguishing characteristics between the two species, in hopes that one day – when out in the field, I could possibly identify correctly if I saw a Hairy Woodpecker! The opportunity came this week, while walking the forested trail alongside the Speed River within Riverside Park, Guelph – Ontario. I heard a rapid TAP TAP TAP and saw wood flying from a tree in front of me. I quickly zoomed in on the tree and watched for at least 10 minutes the woodpecker that was very active in the tree. Immediately, I saw a longer beak than usual and thought to myself, this could be it! Have I found a Hairy Woodpecker for my life list? or is it yet, another Downy? I was pretty certain that it was the larger Hairy, but thought I would confirm at home when I could zoom in on the photos that I had taken. But, then nature offered its best! I heard several bird calls in a tree about 10 feet over from the Hairy. I quickly zoomed in on the tree and there were THREE Downy Woodpeckers flirting around the tree and it was then so much more obvious, with both species present – the difference in size and bill shape! 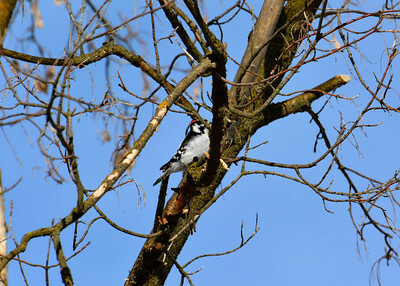 A black-and-white woodpecker about the size of a robin (averaging 9-13″ long). A small black-and-white woodpecker (approximately 6.5″ long). The bill is long, chisel-like, about as long as the distance from the base of the bill to the back of the head. The bill is rather short and dainty, about one-third as long as the distance from the base of the bill to the back of the head. Well-developed “comma-shaped” black mark extending from the shoulder onto the breast. This feature is often less obvious in Downy’s and is sometimes a useful distinguishing mark. Some individuals show a “comma-shaped” black mark that extends from the shoulder onto the breast, though it is often not as obvious as it is on the Hairy. In most of the Eastern U.S., Hairys have completely white outer tail feathers. The white outer tail feathers on the Downy Woodpecker are usually barred in black, giving a spotted effect. In addition to the above distinguishing characteristics, David Sibley of Sibley’s Field Guide shares another new clue for identifying the Downy vs. the Woody and when I looked at my own personal photographs, this clue held true! 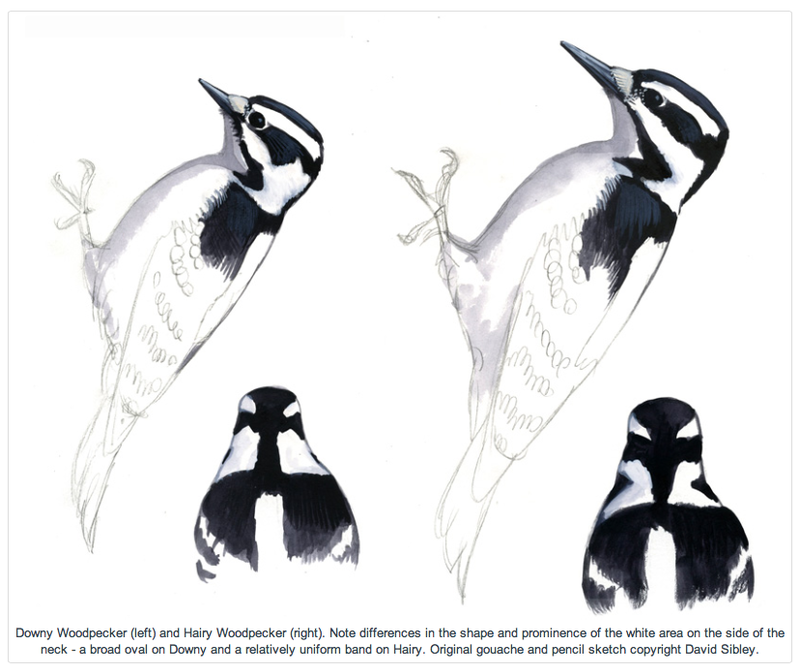 David Sibley points out that the Downy Woodpecker a larger white patch on the sides of the neck.